Its the New Year and we are trying to eat healthier, right? And as much as I’d rather be posting a fun new cake recipe (which I’m sure I will soon)… I wanted to share a healthy recipe that I recently discovered during one of my many late night Pinterest searches. Confession: I don’t love vegetables. Its sad. But oh so true. I wish I did. I wish I woke up and craved raw carrots and a fresh kale salad with sprouts. However… I do not. But just because I don’t love veggies, doesn’t mean I get a pass and never have to eat them. Or cook them for my family. Hubs LOVES veggies. Yay! Good for him! And my two and half year old likes some of them. Yay! So in an effort to live a healthier lifestyle and cook delicious healthy meals for my family… I’m trying. Learning. And getting excited about preparing and loving healthy vegetables. Here is a recent attempt of a recipe I found here. Seemed easy, interesting and not awful! 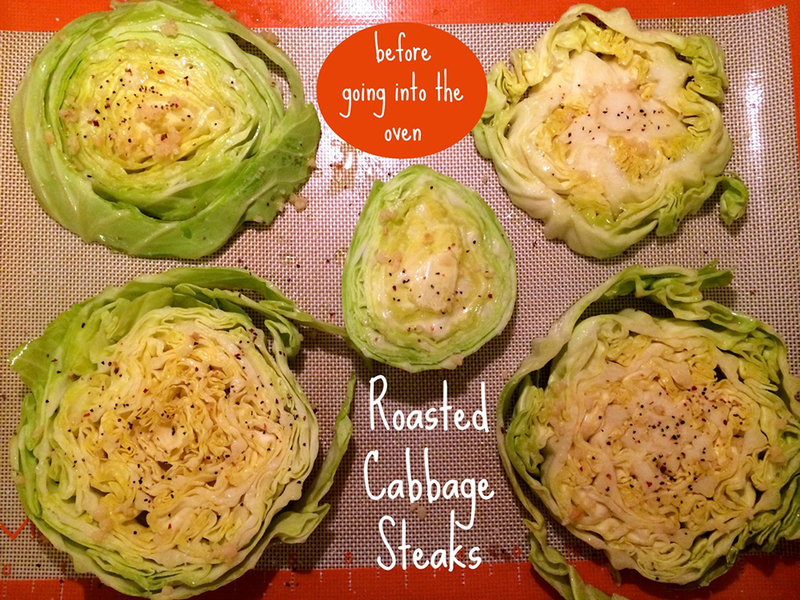 The recipe called for slicing a head of green cabbage into “steaks”, basting with garlic and olive oil and sprinkling with salt and pepper. It was pretty simple. I used my non-stick silicone mat to line the pan but that probably isn’t necessary. They were practically done and even burnt and too crispy around the edges. So I carefully flipped them and baked for only 10 more minutes. The result? They were yummy. I probably won’t wake up in the morning and crave them still. However, I would certainly make them again. 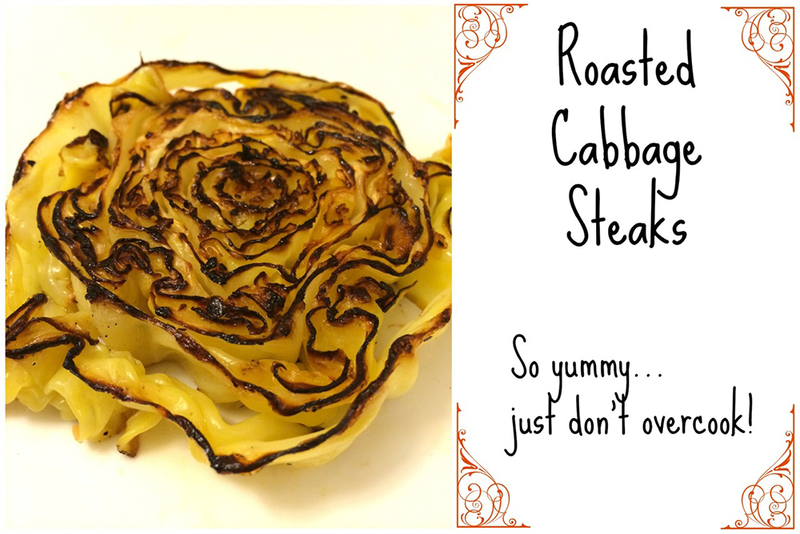 Here is my revised recipe adapted from the original based on my trial and error. Spray a cookie sheet or place non-stick mat on the cookie sheet. 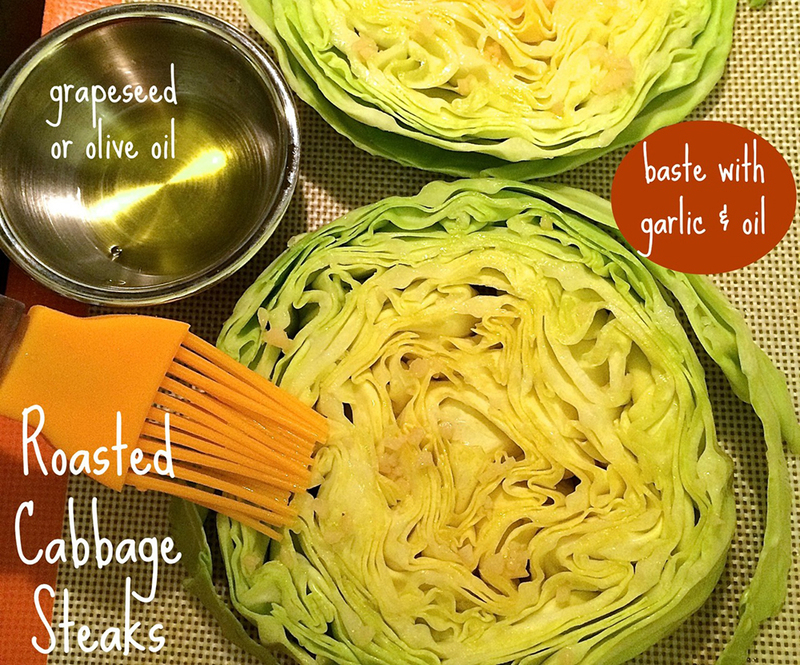 Pull outer leaf off of cabbage and discard. 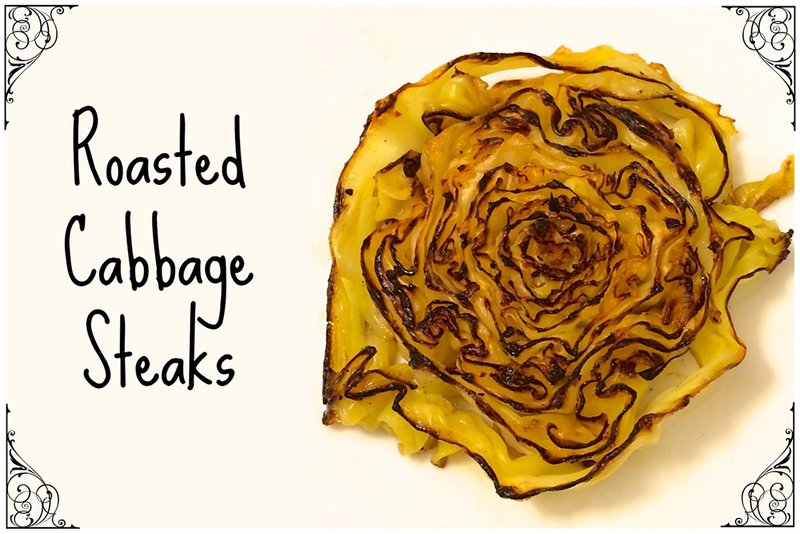 Cut cabbage into 1″ thick slices, beginning with the top and ending with the root, then arrange onto your pan. Carefully rub your steaks with the smashed or minced garlic on both sides. Baste steaks with oil on both sides. 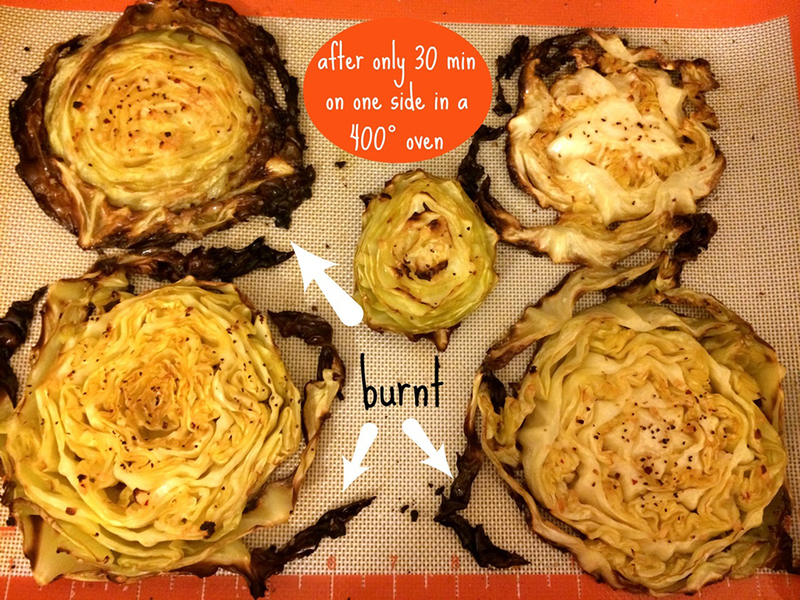 Bake for 15 minutes on each side. Be carefully when flipping your steaks so they don’t fall apart. Ovens vary, so adjust baking time as needed. 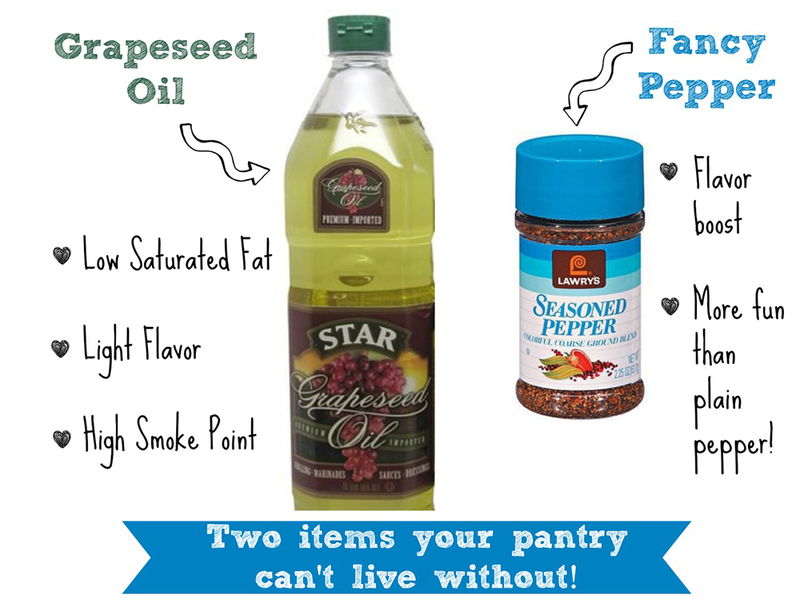 Ingredient suggestions: I prefer using Grapeseed oil when roasting or cooking at temperatures of 400 or higher. Grapeseed oil has a higher smoke point thus handling the higher temperatures better than olive oil. Olive oil can burn and taste metallic when too hot. Grapeseed oil is also my favorite oil to use when making popcorn on the stove and it’s healthier than vegetable or corn oil. I also discovered Lawry’s Seasoned Pepper recently and I’m in love! Adds more flavor than regular pepper and tends to make me use less salt. Less salt is a good thing for everyone.